Its been, umm, a while since I updated. So much of the beginning of the year has been a blur. My mother was in the rehab facility for nearly two months. Since she’s been home I’ve been (trying) to coordinate the home health care, which is a NIGHTMARE! I spend my free time hiding in my room sleeping or knitting. I finished my first cardigan. 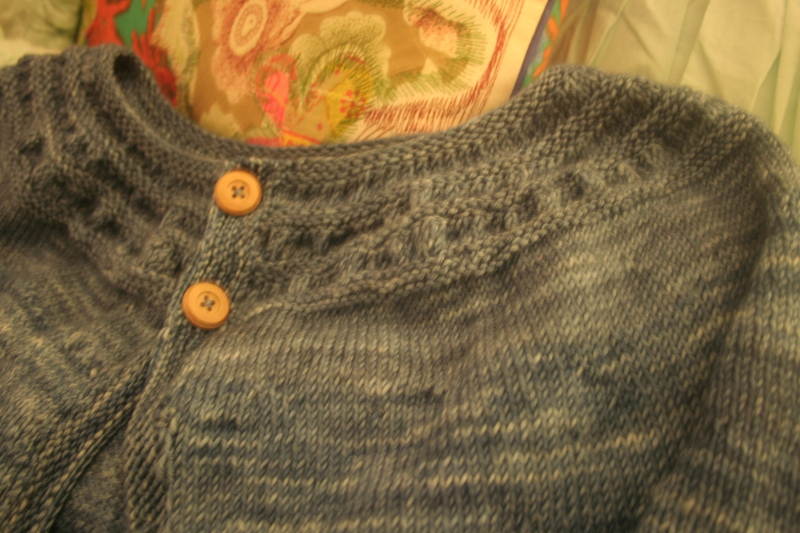 the pattern is called Fig Leaves Cardigan, and its from Madelinetosh. I knitted it in Tosh DK and I absolutely love it. There’s a minor glitch here and there that I caught too late, but nothing terrible. I’ve got another cardigan mostly done, it just needs finishing with the button band. March came along and I decided to do some Malabrigo March Madness to run down my stash a little bit. I’ve done four projects so far with at least a couple more planned for sure. I admit, I am wearing down a bit. As wonderful as Malabrigo yarn is to work with, I’d like to do some other planned things. I’ve bought and planted some herbs and flowers. Hopefully they didn’t drown in just over five inches of rain we got over the last couple of days. The sun is supposed to stick around for a few so that should dry them out. I’m determined to have a well stocked herb garden this year, even if it is a container garden, and we need some flowers to lighten things up. Now to just get the pool pump fixed so we can swim when its warm! Good Luck with your Mom! THe sweater came out great! I can never knit with the same kind of yarn 2 projects in a row. Although I might be able to make an exception for Malabrigo!